Book a thrilling adventure of parasailing and fly over the waters of the tropical Andaman Sea. The excitement begins as you board a boat from the gorgeous Corbyn's Cove beach in Port Blair. You'll ride into the Andaman Sea as the team helps you with the safety harness. At the right time, you'll be gently let upwards. 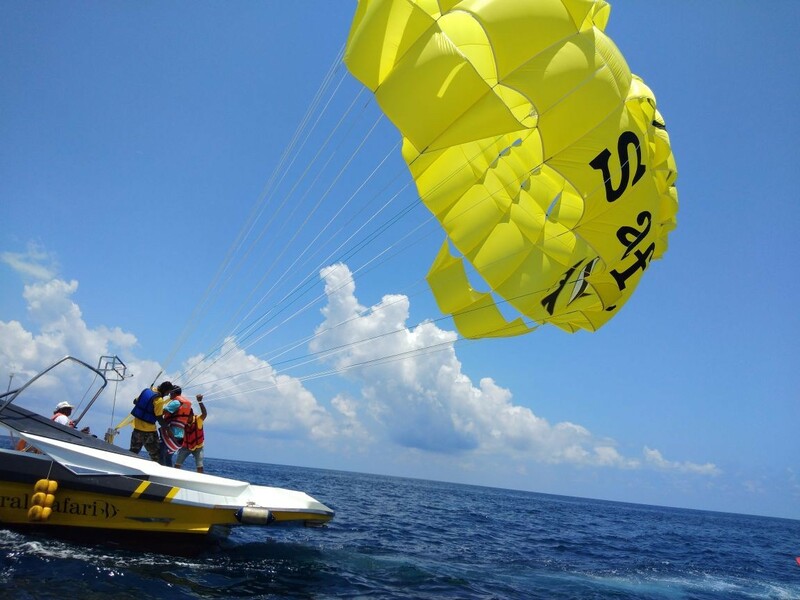 The wind will take your parasail higher, bringing you up to a maximum altitude of 330 feet. 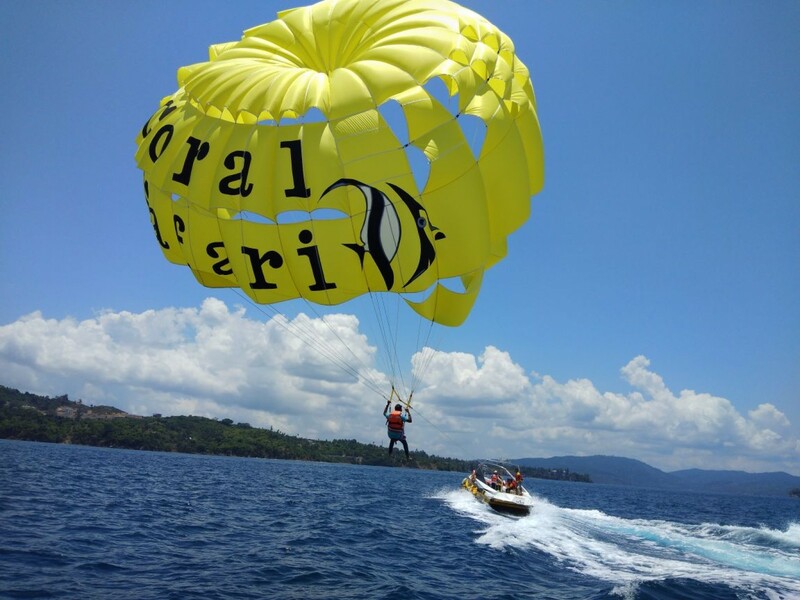 You'll spend a few minutes gliding through the air, as the boat pulls your parasail forward. Glimpse breathtaking views of the Andaman Islands around you and the turquoise blue Andaman Sea below you. A gentle and peaceful adventure, parasailing is an entirely safe activity that does not need any prior experience. The tropical Andaman Islands are a hot-spot for water sports, from scuba diving in the lively, rich sea to kayaking over the calm, still waters. These islands, decorated with palm tree beaches, soft and sandy shores, gushing waves of the Andaman Sea, are often called India's best kept secret. This parasailing adventure allows you to get a taste of that sun, sea and sand vibe of the Andaman Islands by combining the excitement of floating on the air with beautiful views from hundreds of feet above the Andaman Sea. • Fly over the Andaman Sea on a parasailing adventure. • Get spectacular views of Port Blair and the Andaman Sea. • Feel the thrill of gliding in the air over the Andaman Sea. Travellers are required to follow instructions of the tour guide while parasailing in Andaman Islands. Consumption of alcohol, drugs, tobacco products and cigarettes is strictly prohibited while parasailing in Andaman Islands. All cancellations made 15 days or more before departure of the Andaman Islands parasailing trip: 50% refund. All cancellations made less than 15 days before departure of the parasailing in Andaman Islands parasailing trip: no refund. Parasailing is a wind-dependant sport. The tour operator reserves the right to change or cancel the itinerary of this trip due to bad weather conditions or other unforeseen circumstances to ensure maximum safety of travellers and staff. Location of parasailing may be changed to the Rajiv Gandhi Water Sports Complex, depending on weather conditions. Travellers are requested to confirm the location on the day before the scheduled parasailing activity. The tour operator takes utmost care to ensure safety of the travellers and shall not be held responsible for any mishap, accident or loss of life while parasailing in Andaman Islands. No pick-up for this Andaman Islands parasailing trip. No drop-off for this Andaman Islands parasailing trip. Go parasailing in Andaman Islands! Arrive at the Corbyn's Cove beach at the allotted time slot. Alternatively, the location of the activity may be changed to the Rajiv Gandhi Water Sports Complex, depending on weather conditions. It is advisable to arrive 15-20 mins prior to your allotted time. When your time comes, you'll be given a quick brief about the parasailing ride. You'll suit up with the safety harness and ride the boat into the Andaman Sea. At the proper time, you'll be gently let upwards. 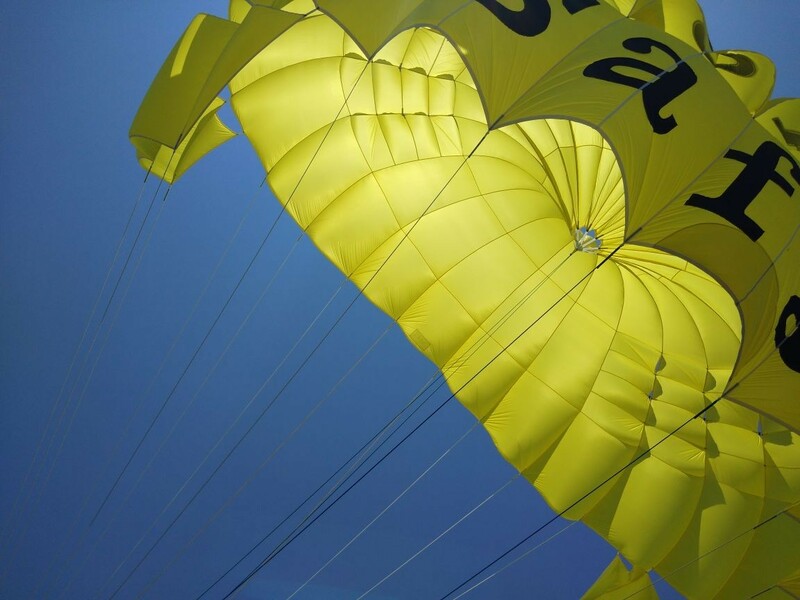 The wind will take your parasail higher, up to a maximum altitude of 330 feet. After spending a couple of minutes gliding in the air, you'll land back in the boat and travel back to the beach. Your trip ends here. Parasailing will be done at the Corbyn's Cove beach, located at a 10-min drive away from the Veer Savarkar International Airport. You may board a flight to the airport and hire a private cab/taxi to the location.